Crop net is the innovative and most effective method to sustain vegetables and promote their vertical or horizontal growth in horticulture. 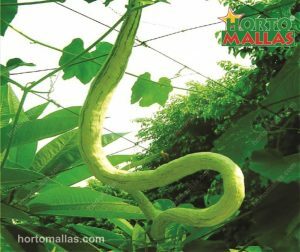 HORTOMALLAS crop net is an extruded product made out of polypropylene that is stretched and bi-oriented to acquire strength and durability. 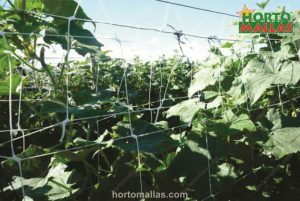 HORTOMALLAS crop net is available in different size. When used in horticulture it is recommended to choose a crop net with a mesh of 25 cm x 25 cm. The workers would find more confortable harvesting, pruning and applying phytochemical products. The hands can easily reach the fruits and so damages are reduced. Especially legumes, cucurbitaceae, and solanaceae tend to grip any available support. Grow net utilizes this natural impulse and offers a more secure mean of support. 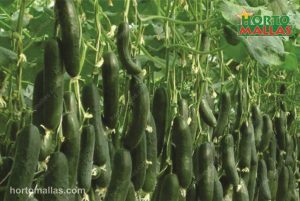 In fact HORTOMALLAS crop netting is very resistant. Its structure made of regular square meshes can sustain heavy crops like watermelons. In case one mesh brakes, the entire vegetable training system stays up. On the contrary, when raffia is used for tutoring plants, the all structure collapses. Crop net supports the peduncle of the fruit. Raffia causes the peduncle to be choked because of the weight of the fruit. 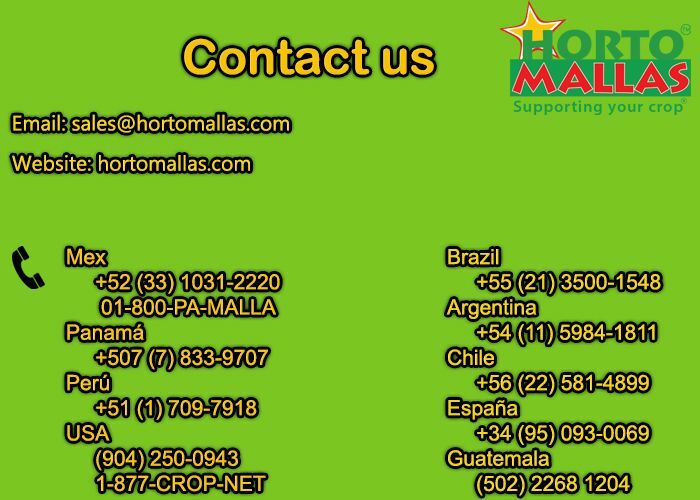 The cultivation network of HORTOMALLAS is a good option since in the market it can be found in different sizes. Usually in horticulture crop netting is used to facilitate vertical farming. Vertical approach is more productive and organic since the cultivation area is optimized and use of chemical products is significantly reduced. Also it helps saving on manual labor. In case of vertical support, the crop net is fixed to a line of metal or wooden posts. These are placed at a distance of 1.5 to up to 8 meters. The distance between them depends on the crop variety, if the soil is blend, and on the climate. It is recommended to reinforce the posts by using tensor strings on the top of them and anchors for gaining a better tension and security. Once the posts are fixed, then crop net is unrolled from post to post and tightened. The best moment to build in the tutoring system is before planting or seeding, at latest when the plant is at its early vegetative stage. We suggest to set up the crop net 30-40 cm above the ground. To get an espalier of 1.80-1.90 m a crop net roll of 1.5m high is appropriate. Post should measure 2.20-2.40 m. Hybrid varieties can need a higher spalier. Inside greenhouses a 3m high crop net can be installed to the roof structure and let it drop towards the soil. A double wall of growing net permits to save more working labor because plants would go vertically and lay naturally over the tutoring trellis on both sides of the plants. As a consequence there is no need of manually intervening by guiding the plants through the spalier. Indeed to install the crop net on a surface of an hectare only two people are needed per day. 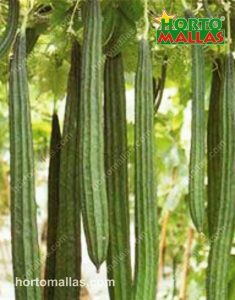 Furthermore this system permits the full development of both the foliage and the product and it is especially recommended for solanaceae. The method of vertical cultivation is the method that brings more benefits as it optimizes the space of the crop and reduces the use of chemical products. In addition to the vertical method the espalier mesh can be used horizontally in crops. A crop net with a mesh of 25 cm x 25 cm can also be applied horizontally over certain crops, such as peppers and tomatoes. In this case the plants and the crops are elevated from the ground and simply lean on the crop net sustained by poles placed on the edges of the net. Excessive humidity of the soil can prejudicate the yield. The use of crop net have many benefits in assuring an abundant and healthy production. On one hand crop net improves the exposition of the plants to the sunlight, because branches are regularly distributed on the screen made out of netting. On the other end, a netting support increases aeration and so it helps to prevent diseases. Finally the direct contact with the soil can provoke many damages, like rotting the fruits or exposing them to the pests attacks.A deteriorated fruit loses its market value. When the plants grow on the ground they are more susceptible to be affected by various diseases: mycosis, virus, bacteria. Viruses are mechanically transmitted by vectors. Insects can be vectors of viruses, but also the hands of the workers, that have been previously infected. A very common and dangerous virus is the Mosaic Virus. Reducing the manual labor thanks of the application of crop net, the risk of spreading the virus is limited. The advantage of acquiring the espalier mesh is that in addition to supporting the plants it keeps them out of the ground and prevents the plants from being affected by the viruses.